From March 2014, as maps of Liberia began to indicate how the Ebola virus was spreading from Guinea and Sierra Leone throughout Liberia, the number of deaths in Liberia were quickly rising. The infections and deaths of health care workers, including doctors and nurses led to the closing of all hospitals to regular care so that diseases such as Malaria, Cholera and Typhoid with similar initial symptoms were being counted as Ebola with no available testing to determine if it was an Ebola virus death. Women with pregnancy emergencies had nowhere to go for help and many died, along with their infants. Almost 100% of infants with Ebola infected mothers die as a result of infection during their birth process. As of Jan 14, 2015 the number of Ebola virus deaths in West Africa is 8,429 with 3,538 occurring in Liberia. Late December 2014 people in Eric’s living compound returned from a visit to distant counties in Liberia and soon discovered they had Ebola and had likely infected others in the compound. In total five were taken to hospital — all have died. Eric had been invited to a local church to enjoy a Christmas meal but within hours was very sick with Typhoid and began getting daily IV treatment from a local doctor. When he returned from his last treatment he found the compound locked under quarantine. If Eric had been inside he would not have been able to leave for 21 days, unable to collect Western Union funds from ICMS, work in our office, teach at the Bible School, visit villages or accept invitations to preach on Sundays. Your constant prayers for Pastor Eric are vitally important. embraced and buried the body themselves thus getting infected when the body is most virulent. The Liberian government responded to this practice by donating a new 50 acre plot of land for a cemetery where people would be buried and previously cremated victims would be given a marker to indicate their death. 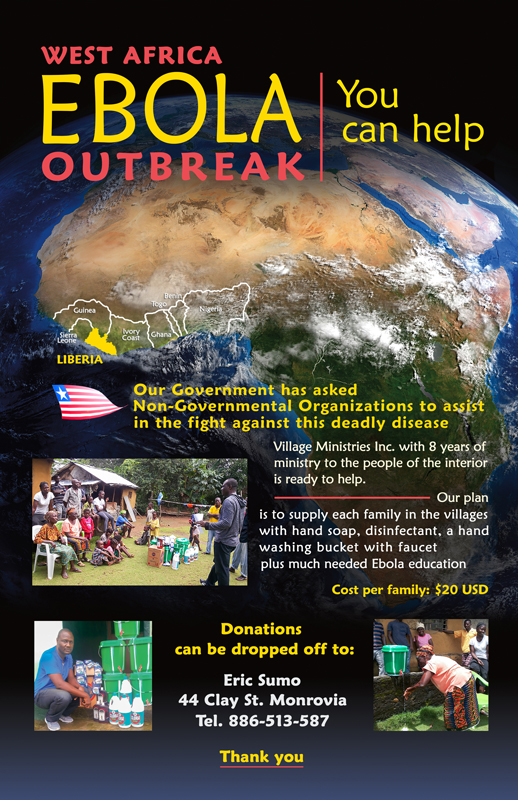 When the international community teams and money arrived, their help and funds were immediately applied to the crisis of caring for the dying, but no money or manpower was given for prevention by education and hand washing kits for the 1.5 million people living in the villages of the interior of the country. The people of the interior needed to stop eating bush meat, specifically bats and monkeys, believed to be carrying the Ebola virus. 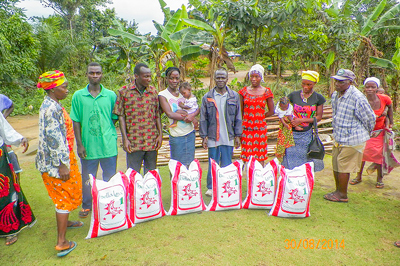 When county borders were closed Pastor Eric delivered bags of rice to these isolated villages. The reputation of Village Ministries spread, through the mostly Muslim villages of the Interior, to people who had never heard of this Christian ministry and we believe in this way God has prepared their hearts to allow us to return and show the Jesus Film or put down a well which has in the past led to an invitation for us to build a Christian church and share God’s Word on a regular basis. By God’s grace we will experience these new opportunities created by the Ebola Virus epidemic. This project has allowed us to build relationships with new Muslim villages and along with the teaching we have been supplying hand washing buckets, bleach and hand soap to village families as requests and funds come in. Cost per family: $20.00 USD. 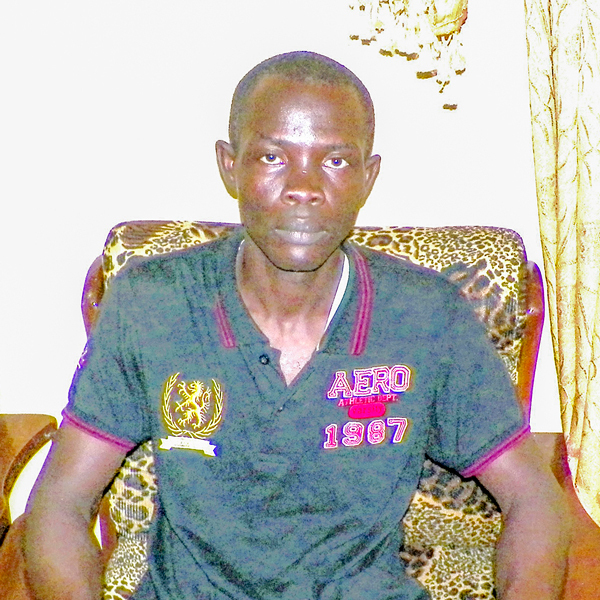 In 2014, Lahai, a Muslim since birth, lost his whole family to the ravages of the Ebola virus. When he began to feel unwell he was very fearful and someone told him to call Pastor Eric who prayed for him over the phone and promised to pray for him for the crucial days of the next week. 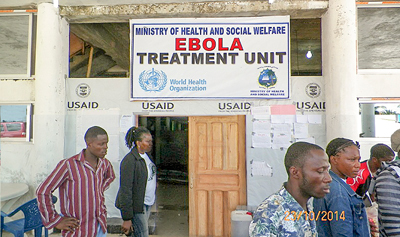 Lahai tested positive at an Ebola clinic and remained for treatment. After a week his blood showed no further signs of Ebola virus and he was discharged. 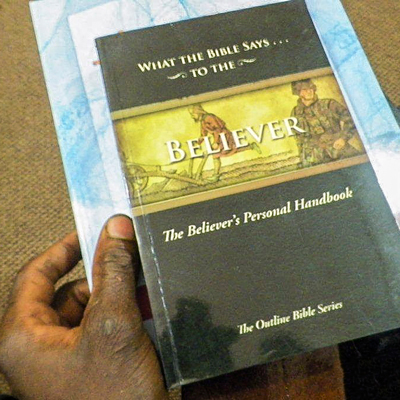 In his gratefulness he called Pastor Eric to report the good news and Eric invited him to the Village Ministries office where he led Lahai to the Lord and provided him with literature to help him. 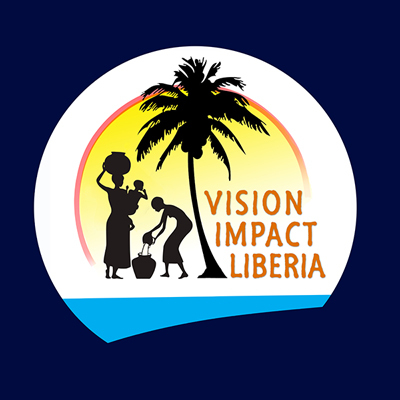 There are now approximately 1,000 children orphaned by Ebola in Liberia. 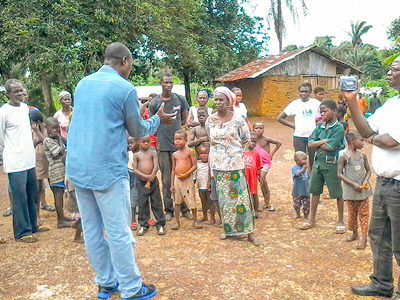 The area in and around Kakata township, Margibi County has about 200 children whose parents or caregiver died of Ebola. The fear of contracting Ebola from these children and the stigma of having a family member who died of Ebola is so powerful in the community that it keeps family members or even neighbors from accepting these children into their homes—no one wants to touch them. The children have been wandering from house to house asking for food and have been allowed to sleep in a local church. 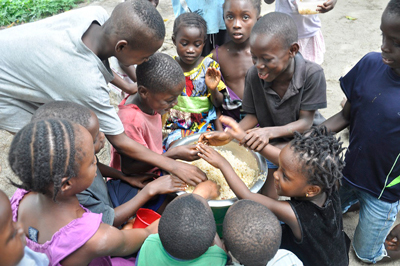 Pastor Eric gathered donations of food and clothing in Monrovia and delivered these to the children.